Our dining options are a great example of why our motto is “It’s All Here”. Diamond Buffet is open for brunch and dinner with a huge selection of mouth-watering choices and daily themes. Or if you’re looking for pub food, drinks, and a game on the big screen, settle in at the Molson Canadian Lounge. Want a quick, delicious meal? Check out Foodies for burgers, rice bowls, and more. Planning a group event? Get a free room rental of Escape Lounge with purchase of a catering package, or mingle with good company at Homestretch while watching live horse racing entertainment (open on racing days). We know your stomach is growling already, so click on your venue of choice for more info, hours, and menus. With so many incredible menu options, you’ll be saying cheers to our bartenders with your favourite drink in one hand and giving a thumbs-up to our finger foods with the other. If you manage to free up your hands, you won’t be able to keep them off our tasty entrees either. Menu items at the Diamond Buffet may vary from the above photographs. Prices will vary for Specialty Buffets. Tax and Gratuities not included. Elements Casino team members wear their pink shirts during their shift to create awareness around Pink Shirt Day and support anti-bullying initiatives. On December 1, 2017, Elements Team Members were able to drop off 5 boxes of toys, totaling over 100lbs, to the Children’s Hospital. The toys were collected from Team Members and Guests. Then, on May 3, 2018 staff participated in Jeans Day. Team Members who wore jeans donated $5 to the BC Children’s Hospital. We were proud to raise $245. Westcoast Motorcycle Ride to Live, in support of Prostate Cancer Foundation raised $175,000 at Fraser Downs on Sunday, May 31st. Sophie’s Place Child Advocacy Centre and The Centre for Child Development is the signature charitable partner of Elements Casino. This partnership has allowed Elements Casino to contribute to the development of the Centre. Sophie’s Place is a child advocacy centre focused on providing specialized services to physically, mentally or sexually abused children in a safe and child-friendly setting. The Centre is the result of a significant collaboration between the Surrey RCMP, Ministry of Children and Family Development, City of Surrey, Ministry of Justice (Victim Services and Crime Prevention), and The Centre for Child Development. The Centre for Child Development provides specialized pediatric medical rehabilitation services and supports 2,400 children with special needs and their families through 30,000 service sessions per year in Delta, Surrey, South Surrey, White Rock, Langley and other areas of the Lower Mainland. While the Centre serves 2,400 children each year, as many as 25,000 South Fraser children and youth may have some form of developmental disability and 3,000 may have severe disabilities. The Arts Council of Surrey has been working on behalf of the arts community for more than forty years and each year continues to expand its scope of service and influence. It exists to create awareness, appreciation and pride in the artistic and cultural achievements of our community. The Arts Council sponsors and produces more than 15 events each year in addition to participating in community events such as the City of Surrey Fusion Festival and Children’s Festival, the Surrey Association of Art Teachers student exhibit, the Cloverdale Blueberry Festival and various other community events. Fresh, fast and far from the ordinary, Foodies brings you the world of good eating in its own laid-back universe. Dig into a great burger, made to order and made just how you like it. Have a steaming hot and delicious rice bowl, grab a fresh wrap, bite into a crisp salad or something fresh baked and quick, it’s all here and it’s all good at Foodies. The Dragon Lounge is a private venue where guests can host birthday parties, dinners and fundraisers with no room rental fee with a purchase of a catering package. Singe and Dance your heart out the first Friday of every month to Karaoke and every Saturday to Asian Live Entertainment! Play our Race to Win slot machines for your chance to Win a New Car! More selection, more excitement, more action! Elements Casino is proud to offer over 500 of your favourite and classic slot games out there! Sign up for a free Encore Rewards card and start earning points while you play the slots. Once you have enough points you can redeem them for free play! Please see Guest Services to sign up and get more information. Our casual dining and racing venue offers floor to ceiling windows with both trackside and terraced tables that make it the perfect location for fundraisers, large groups and small gatherings. Our racing season begins Thursday, September 20, 2018 with the delicious Homestretch Buffet beginning Friday, September 21, 2018! To make your reservations, please contact our Reservations Department at 604.575.5603 or reservations@elementscasino.com. Fine Print: Please note our seating is terraced. If anyone in your group has difficulty with stairs please let us know when booking to ensure the required seating is available for your group. No refunds or credits after final confirmation of numbers. Prices do not include programs or gratuities. Switch Your Encore Card to Elements Casino! After you switch your old Encore Card to a new Elements Casino Encore Card you’ll be entered into a draw to win a Grand Prize of $1,000. There are also an additional 10 “Buffet for 2” prizes. *Must be present to win the $1,000 on January 28th at 7:00PM, otherwise the prize will become $500. Double Your Jackpot Every Week! We match the jackpot up to $1,000 if your name is drawn. Earn Ballots for every jackpot you hit during the week. Elements Casino presented a cheque to the Surrey Hospital & Outpatient Centre Foundation (formerly Surrey Memorial Hospital Foundation) for $500. The Foundation champions exceptional care for patients and families living south of the Fraser by raising funds for the Surrey Memorial Hospital and the Jim Pattison Outpatient Care and Surgery Centre. Elements Casino Surrey proudly filled 10 shoeboxes full of essential items for the homeless. They included donated and purchased items for women. Every year, thousands benefit from Surrey Women’s Centre’s services and demand for them continues to increase. Each woman’s story is different but the need remains the same – all survivors of violence deserve a safe place to begin the healing process. On December 9, 2017, Elements Casino Surrey Team Members gave out cookies at the local Fire Hall. On June 4th, Elements Casino Surrey team members raised $120 and participated in a Run, Walk & Roll for Sophie’s Place. Play any one of our 10 slot machines for your chance to win $1,000,000 and $1,000,000+ Progressive jackpots! Any bet at any time. Elements Casino is PROUD to support the Surrey Food Bank in its efforts to provide services to the local community by collecting donations and volunteering to sort food. The Surrey Food bank is a non-profit charitable organization that is managed by staff and volunteers that count on donations from individuals, organizations and corporations, including fundraising efforts, such as our Fill the Truck fundraiser, to provide groceries for those in need. What is Proud of Our People, Our Business, Our Community? At Elements Casino, we recognize that our volunteer efforts and presence in the community is as integral to our business as the operation itself. As a member of the Great Canadian family, Elements Casino is humbled by the opportunity be an active community partner in Surrey and the region. PROUD of our people, our business, our community is Elements’ brand that represents our community, volunteering and social responsibility efforts. Simply put, we are PROUD of the positive difference that Elements Casino can make by supporting local organizations either through time, resources or talent. Our PROUD employee volunteer program allows us as an organization to recognize, encourage and most importantly reward the efforts of our colleagues who volunteer and support their communities. It is because of their charitable endeavours and desire to help their community that we are able to achieve our goal which is to positively impact the various needs, causes and projects that matter the most in our communities. Every year, Great Canadian invests over $2.5 million in communities across the country. Elements Casino’s PROUD community activities, countless volunteer hours and hundreds of events and fundraisers support this contribution and directly impacts local groups and those that they help. To read more about Element’s Casino community initiatives, please scroll down on this page. To learn more about Great Canadian’s support of all of their communities, please click here ►. In British Columbia, approximately two-thirds of gross gaming revenue from the gaming facilities goes directly back to the government, through the BC Lottery Corporation, for the purpose of supporting programs like healthcare, education and social services. The remaining one-third of gaming revenue is retained by service providers, such as Great Canadian Gaming Corporation, to pay for wages, building costs, taxes and other operational services. One of the ways Elements supports its community is by hosting various fundraiser events that bring people together and help raise money for an important and meaningful cause. If you’re part of a local organization whose work and diversity of programs are dedicated to the community, we would be happy to review your community partnership request. To give you an idea of how we might support your next fundraiser event, here are some of the services we offer for our community groups and organizations. Our parent company, Great Canadian Gaming Corporation, was founded on charity casino events dating back to early 1980’s. In the spirit of keeping this part of our history alive, Great Canadian Gaming Corporation together with our Elements team is able to support you in creating a casino themed event. The charity organization hosting the event will be responsible for obtaining an appropriate license for the casino event. To help profile your next silent or live auction event, some of Great Canadian’s sites are able to donate exclusive entertainment packages to mark any and every occasion. From luxurious hotel stays at the Four Diamond River Rock Casino Resort to exclusive VIP dining experiences and exhilarating passes at the best racetracks in Western Canada, there will be something for everyone to enjoy! Let us take care of your charity or non-profit’s next fundraising event from start to finish. Elements Casino is happy to consider your request to host a beer and burger fundraiser on site with partial proceeds going directly to your charity or non-profit. Our team will work with you to accommodate your needs, customize your fundraiser, and create a fun and social event that everyone can support and enjoy. Looking for a place to hold your fundraiser or gala? Many community groups have used our facilities to amp up their event. At Elements Casino, volunteering is one of the key pillars of our community giving. If your organization is in need of volunteers who are required to support you in numerous activities or for a special event, please let us know what you need, and we will do our best to generate interest and awareness amongst our staff. As a multicultural organization, our colleagues at Elements Casino speak a number of different languages and dialects. Through our translation services offered, we can assist community groups in unique ways that many others can’t. *Must have an Encore Rewards card. Not a member, sign up for Free! To help grow our PROUD commitment, we are always looking for opportunities to work with community leaders and organizations that effect positive change, in whatever capacity would be most valuable to them. Here are some common principles and values we look for in a PROUD community partner. We look to support groups and organizations whose mandate is local and whose work has a direct impact on their community. To create healthy and active relationships in our community, we strive for partnerships rather than a sponsorship. We value an organization’s diversity of programs they offer in support of their community. We expect groups and organizations to employ sound financial practices and sustainable funding tactics. We encourage registered charities and non-profit organizations to contact us if they feel they are consistent with these principles, but regrettably we cannot support religious, political or advocacy groups, individual fundraising pursuits, or organizations that are inconsistent with our values. Want to partner up with Elements Casino? Send us a sponsorship request by clicking here. We will review your application and get back to you as soon as possible. Every day of the week quench your taste buds with a featured drink for only $5.00! *Must have an Elements Casino Encore Rewards card to receive the discount. To convert your Encore Rewards card to an Elements Casino Encore Rewards card please visit Guest Services. Prices are subject to change without notice. We are PROUD to have raised just under $1,000 for The Terry Fox Foundation on Saturday, September 17 through the Elements Casino Terry Fox Car Wash.
September 30 – October 31, play POWERBUCKS at Elements Casino for your chance to win 1 of 3 VIP Vegas Experiences with your Encore Card! 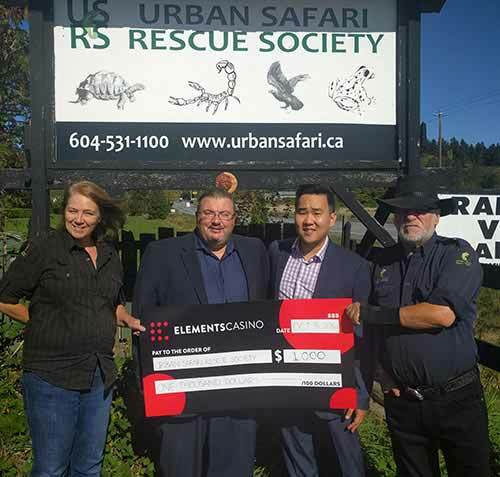 Elements Casino is PROUD to donate $1,000 to the Urban Safari Rescue Society, a non-profit organization that focuses on rescuing and caring for exotic animals. The Urban Safari Rescue Society provides a sanctuary for unwanted exotic animals with a team of volunteers assisting in care and rehabilitation, as well as educating children through a variety of avenues about these animals. For more information and to donate, please visit http://www.urbansafari.ca. Elements Casino is PROUD to support the Pathfinder Youth Centre Society by presenting a check on October 14, 2016 for $1,000. This non-profit offers positive and accessible pathways to education, life skills, employment training and recreation for young people (between the ages of 15 to 30) and their families. For more information or to donate please visit http://pathfinderyouthsociety.org/. Win up to $4,200 in total prize money! The series finale will take place on December 16th. For contest details, click here. Grab a drink, a brush and let the painting begin! Elements Casino presented a check to the Surrey Crime Prevention Society. We are PROUD to support this society’s efforts in crime prevention. Surrey Crime Prevention Society takes a 360° holistic approach to community safety through programs delivered by trained and dedicated volunteers. Surrey Crime Prevention is committed to supporting community safety and public awareness. For more information or to donate visit: http://preventcrime.ca/. *To qualify for the offer, present your $12.99 Made to Order Pasta Buffet receipt given to you that day to Guest Services. Guest Services will then add the bonus offer to your Encore Rewards card. You must have an Encore Rewards card to claim your Free Offer. Not transferable. You can now wager on Hong Kong races! Deposit your non-winning Hong Kong racing slip with your full name & phone number and enter to win $10 in slot free play or table games match play every Thursday & Sunday at 1pm. * Five winners will be selected each drawing day. You do not need to be present to win. *Must be an Encore Rewards card member. Not a member? Sign up for FREE! Win up to $5,000 Cash at 8pm & a chance to win a trip to Las Vegas! *Must be an Encore Rewards Card member. Not a member? Sign up for FREE! Ballots and instant prizing are awarded once a day during the contest period. Swipe your Encore Rewards card after 3pm every Friday to activate your ballots for the Friday draws! For any questions regarding this promotion, visit Guest Services. *Only for Triple Diamond Encore Rewards card member. *Prices do not include tax & gratuity. Call Guest Services at 604.576.9141 for more details. Visit Guest Services for more details. Must have an Encore Rewards card to participate. Must be present to win. Only in the Phoenix Room. For more information, visit Guest Services. *Must be present to win. This promotion can be cancelled or changed at any time without notice. For more information, contact Guest Services at 604.576.9141. *Winner does not need to be present. Stamps cannot be combined from Buffet Loyalty cards earned prior to August 1st, 2017. Win up to $50,000 in Cash! Win the Bad Beat 21 Progressive Jackpot and win up to $50,000! Win with 3 cards (6,7 & 8 of Hearts) and be beaten by the dealer’s blackjack of Hearts. Progressive starts at $5,000. $500 added daily. See Guest services for more details. Join us for a limited time Thanksgiving themed buffet. 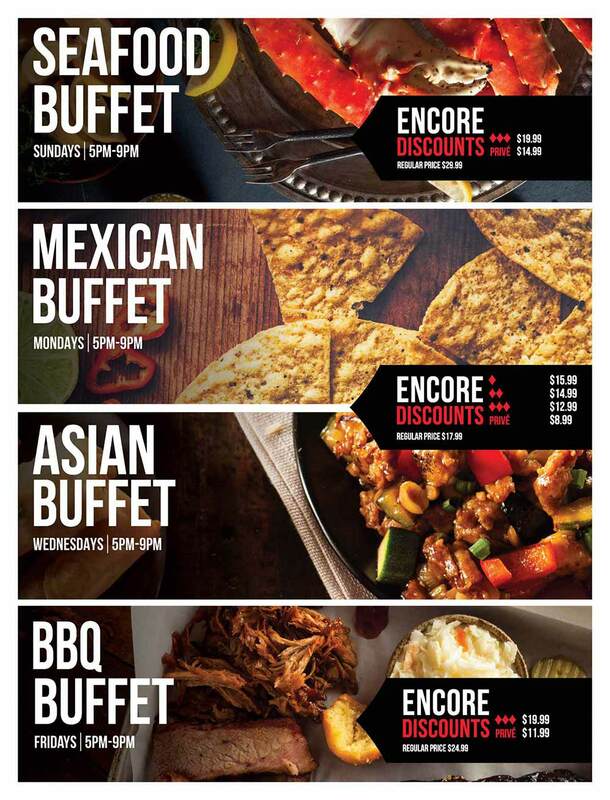 This buffet is only available on Sunday October 8th and Monday October 9th from 5pm to 9pm. For only $18.99 per person you can enjoy all of your Thanksgiving favourites! Over $4,500 in Total Prizes! Every Saturday from October 7 to December 23 in the Racebook there will be draws at 11am, 3pm and 7pm. Each draw will have a $100 Wager Winner! If winner is not present the amount is carried over to the next draw! Join us on Saturday, October 21, 2017 for Delhi Lights, our inaugural charity event in collaboration with A Town. Come dressed in your Bollywood attire, with canapés, drinks and live entertainment featuring Kirti Arneja. Traditionally it is conisdered auspicious to gamble during Diwali so why not try your luck for a goof cause? All proceeds from Delhi Lights will be dontated in support of Hanna and Ameila’s Angels Foundation, a charity dedicated to improving the lives of impoverished children in Delhi and Canada. This year the charity will be building a school in Delhi. Win your share of $1,000 in Cash each week! Earn 1000 points from Sunday to Thursday to qualify. Up to 5 entries per person per week! Tournament to take place every Thursday from 6pm-8pm. 1st place will win $500, 2nd will win $300 and 3rd will win $200 – all in cash! Join us in the Racebook every Friday during live racing to enter our free Handicapping Contest! First place will win a $75 Win, Place, Show wager on a horse of their choice during our 10th race. Second will win a $50 wager while third will win a $25 wager! Also the top three winners from each week qualify for the Finals on Dec.8th to win even more wagers! B.C’s richest day in Standardbred Racing is here! Join us as we host 11 races including 4 Stakes Races each with a purse of $100,000. Be sure to reserve your spot today as they are going fast. Call 604.575.5603 to book now! See Guest services for further information. Win up to $5,000 in Cash! Earn 1000 points daily to get ballots and receive 1 ballot for every buffet purchased. 5 names will be called per draw and those who show up will split the draw. Earn ballots on all your favourite games. Win cash and prizes on our plinko board. Win up to $10,000 when you sign up for Encore! Play Your favourite Tables Games and earn ballots for our weekly draws! Draws every Friday at 7PM to win your share of $1,500 in cash and match play! 3 winners will play Zodiac Match each week to win up to $2,250 in cash and free play! Win your share of $1000 in Free Play! See Guest services for more details. Must be a Double Diamond Guest to enter. Free Play Giveaways, Free Hot Dogs and More! Surrey’s only monthly South Asian Event. No Cover. Free Chinese Appetizers at 8pm & 9pm! Win a hand paid jackpot of $1500 or more to receive a ballot for Make it Rain! $7.99 or $5 with a $10 food purchase at Molson Lounge or Foodies. Enter to win $50 Free Play or $25 Cash when you enjoy our Late Night Dessert buffet. Earn 500 points to receive a ballot. Max 5 ballots per day. Draws every Monday, Tuesday and Wednesday at 12pm and 8pm starting March 5th! The progressive jackpot begins at $10,000! It will increase by $500 after each draw if the jackpot is not won. Swipe daily for your chance to win your share of over $250,000 in instant prizes! By swiping every day you will also earn entries for your chance to win 1 of 9 tickets to the Slot Classic Semi-finals valued at $2,500. Enter to win $50 Free Play or $25 Cash when you eat at the weekend brunch buffet! Only $12.99 + your Encore Rewards discounts. Earn up to $500 in Match Play daily! Win 2 tickets to see the Canucks vs. Edmonton Oilers on Thursday, March 29th at Rogers Arena. Earn up to 5 ballots per hour in the Phoenix Room. The draw will take place on March 18th at 8pm. Win a pair of tickets to The Price is Right Live! Starting earning ballots March 11th by earning 500 Encore Points. We will draw 4 names per draw and the closest guest will win a pair of tickets to The Price is Right and the item displayed. The other 3 contestants will win $25 Cash! Draws take place on Saturday’s at 8pm from March 17th – April 14th. Win 2 tickets to see Na Ying Live on April 10th at the Queen Elizabeth Theatre! The draw will take place on April 1st at 8pm. Receive a ballot for every 250 points earned and pick the prize you want to win! Win your share of over $6,500 in cash and match play! Earn up to 5 ballots per hour playing your favourite table games. On your first visit, see Guest Services with your $5 buy-in to get $10 Free Play. 3000 Encore Points gets you a $30 Scratch & Win for a chance at $2.5 Million! 1000 Encore Points gets you a $10 Scratch & Win. 500 Encore Points gets you a $5 Scratch & Win. In the Molson Canadian Lounge at Elements Casino Surrey. Collect 10 stamps to enter and receive a free buffet. Receive 1 ballot for every 500 Encore points earned. Eat at Wednesday Stir Fry Nights and earn points to spin. Bring your buffet receipt to Guest Services to redeem. Win 2 tickets to see Harry Styles at Rogers Arena on July 6th. Earn ballots in the Phoenix Room by playing your favourite table games. Win your share of $11,000 Cash! If the $1,000 cash jackpot is not won, it will roll over to the next draw. Earn 2 ballots for every 500 Encore points. Swipe daily to win your share of $150,000 in instant prizes. Win up to $10,000 in cash and Match Play. Visit daily starting June 1 for your chance to win cash and candy with four Hot Seat draws at 2pm, 4pm, 6pm and 8pm. Beat the banker, win the cash! Must be an Encore member to participate. Restrictions may apply. Weekly draws every Wednesday at 8pm. Restrictions may apply. Must be present to win. Must be here to win. Prize amount rolls over if not won. Restrictions may apply. Live at Elements Casino Surrey! Win your share of over $10,000 Free Play! Win your share of $1,000 Free Play every Thursday. Draws take place at 10:30am and 7:30pm. 5 names will be drawn to split $1,000 Free Play. Earn 1 ballot for every hand pay jackpot on $0.05, $0.25, $1 slot machines on the third floor. Win 2 tickets to see Justin Timberlake at Rogers Arena on Thursday, November 8 at 7:30pm. Earn ballots by playing your favorite table games. Swipe daily to win your share of over $230,000 in instant prizes! Must be an Encore member to win. Restrictions may apply. Must be an Encore member to participate. Must be present to win. One guest drawn per draw. Earn 5000 points on any 5¢, 25¢ or $1 slot machine on our third floor to enter. Play Dynamic Dollars at any Great Canadian Casino for the chance to win the progressive jackpot of up to $50,000! Next draws on December 1,15 & 29. Raise a glass and celebrate the New Year with us. Join us for an evening of entertainment, cash giveaways and party favours. Plus, receive unlimited appetizers and a glass of bubbly for only $15. Our casual dining and racing venue offers floor to ceiling windows with both trackside and terraced tables that make it the perfect location for fundraisers, large groups and small gatherings. Earn ballots by playing your favourite table games. Look for red gifts to win bonuses while you play. For a golden bonus, find a slot machine with a gold gift. Your chance to win a share of $1,500 cash every Sunday. No current promotions, check back for updates soon. Enjoy a $3.99 Breakfast at Foodies from 7am – 9am. $3.99 price applies to Easy Start Breakfast only. Enjoy your $7.99 Lunch Buffet daily from 11 am – 2 pm. Must be an Encore member to participate. Stat holidays excluded. Earn one spin for every 50 points. Win up to $600 Free Play – the more you spin, the more you win. Unlock up to 16 U-Spins 7pm – 9pm every Saturday. On any first floor slot machine, just earn 25 points to get your first U-Spin. Maximum 4 U-Spins every 30 minutes. Must be an Encore member to participate. Eight lucky winners will advance to the finals for a chance to win Free play for a year on February 5. Free Play for a year will be distributed at $500/week. Free Play can only be used for Table Games. Restrictions may apply. To reserve, call 604-575-5603. Space is limited. Enjoy a three-course dinner for two plus two glasses of bubbly for $49.99. Make your reservation today by calling 604-575-5603. $29.99 Dinner option available for one person. Hourly draws from 3pm – 11pm. Lion Dance at 7:30pm. Earn ballots for every 1000 points from January 27 – February 4. Then visit Guest Services on February 5 to pick up a free ballot. Every Wednesday you have a chance to win one of three prizes. One lucky guest will be drawn every Wednesday at 7pm to pick from one of three luxury prizes. Virtual draw barrel will be emptied after each draw. Must be present and an Encore Member to participate. $200 Cash up for grabs every hour. Swipe daily to earn virtual ballots – swiping on Sundays gets you 10x ballots. Must be present to win. Prize amount rolls over if not won. Promotion does not run on stat holidays. Free Buffet Every Sunday Night. Monday – Friday, 5pm – 11pm, join us for our nightly specials. Bonnie Kilroe’s one-of-a-kind Divas: Vegas meets Vaudeville celebrity impersonation spectacle! This is a one-woman show that will make your head spin. The show is one-part tribute, one-part farce, where Bonnie will have you laughing and crying, sometimes within moments of each other. So, if you love your divas and you love your celebrity impersonators, this is a show you simply should not miss! The rainbow ends at Elements Casino Surrey as we go green all weekend long to celebrate St Patrick’s Day! Three live bands will also provide entertainment for the whole weekend. Expect to have an Irish jig in your step while you listen to some of Ireland’s greatest musical hits mixed with the classics from the rest of the world! See our lineup below. Win Your Share of $6,000 in Cash and Free Play Weekly in Our Midweek Madness Draws. Earn ballots all week long by playing on the Privé slots level then pick up your ballots from Guest Services on Tuesdays and Wednesdays. One ballot per 1,000 points earned on the Privé slots level. Must be Encore Rewards member to participate. Other restrictions may apply. All You Can Eat Prime Rib and Lobster Tails Buffet for $9.99*! Every day between April 1st -30th, at 1pm, 6pm and 11pm players who are actively playing on a table will have a chance to win up to $250 free play each day. This promotion opens to all table game players. Join us for an unforgettable date night with you and your loved ones. Come and enjoy a three-course dinner for two, plus two glasses of bubbly for $49. This Mother’s Day, treat your mom to a special brunch at Elements Casino Surrey. Like bird flu on an international flight, Byron Bertram travels well. His innate talent for voices and accents mixed with a confident vulnerability has taken him across the world and established him internationally as one of the top Canadian comics working today. Door opens at 7:00 pm and show starts at 8:00 pm. Sign up for our newsletter to stay up to date on all the incredible things coming to Elements Casino! I confirm that I'm 19 or older.